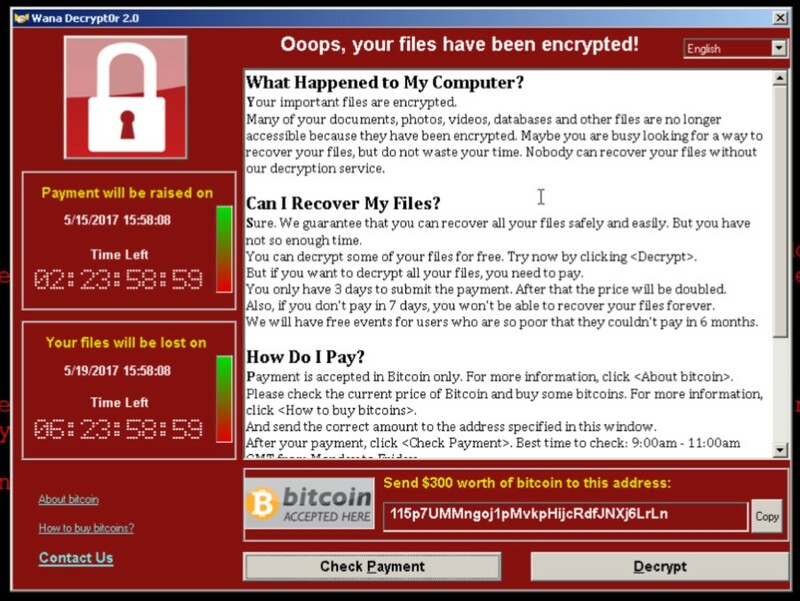 Most of the modern ransomware variants encrypt personal files on an infected machine. The same operating system that's sitting on your desktop at home so that you can write email and watch cat videos is running our hospitals, our rail systems and all sorts of other critical infrastructure. private and public sectors, ransomware is indiscriminate. Schools get hit. Churches get hit. because the alarming reality of ransomware is that it often makes good financial sense to pay. back versus not paying and losing everything, you can see why victims pay. that this remains a very big problem. The ransom is $300 and you've got 3 days to pay before it doubles to $600. 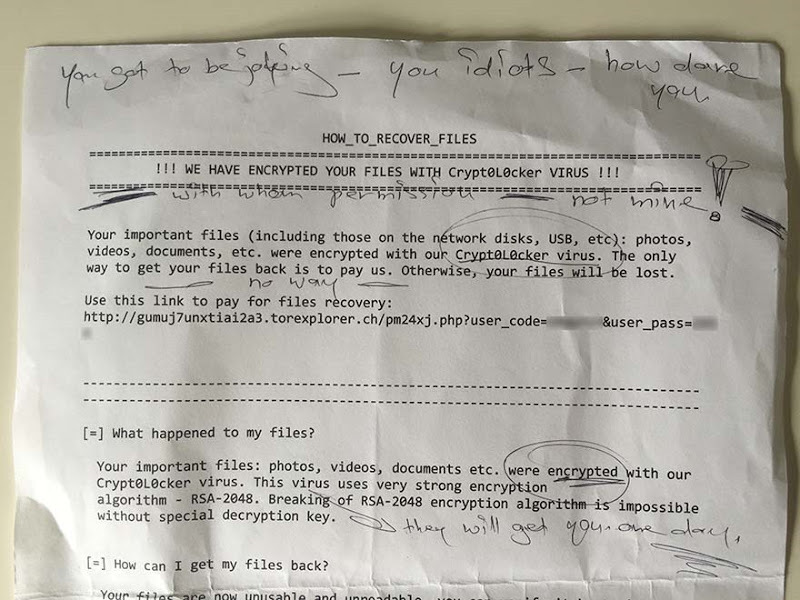 If you don't pay within a week then the ransomware threatens to delete the files altogether. such as Samba are impacted. The file tasksche.exe checks for disk drives, including network shares and removable storage devices mapped to a letter, such as 'C:/', 'D:/' etc. The malware then checks for files with a file extension as listed in the appendix and encrypts these using 2048-bit RSA encryption. Talos first detected this variant of malware shortly before 9am UTC on the 12th of May. the top row of the keyboard. In other words, someone mashed the keyboard to generate it. worked out what was going on and simply registered the domain name! taking any at-risk machine off the wire until it's patched. off for a bit. It'll be interesting to look at those Bitcoin addresses in another 48 hours. You know how people say you should keep your software up to date, right? Hello? precisely what it's configured to do straight out of the box - just don't disable it! cost of rectifying non-functional web apps within the organisation was a 7-figure amount. dependencies, but the alternative is quite possibly ending up like the NHS or even worse. Bottom line is that it's an essential part of running a desktop environment in a modern business. there - "but everything is working ok at the moment, right?" there is no "oh, we didn't realise" or other cop out excuses here, someone screwed up big time. you're in a fundamentally better position than having lost your files (short of paying the ransom, that is). stuff goes wrong either, it's one of those "in advance" sort of things. Is this the NSA's fault? This is where it gets a bit political: the SMB vulnerability Microsoft patched was known by the NSA. after the vulnerability had already been patched, so what's the worry? Update says "install me!". But you should do that anyway. only thing we can uniformly agree on here is that we've gotta get better at patching our things. and we're all assessing what the total damage will be whilst waiting for new variants to follow. until we get that right, other subsequent variants will hit those who are unprepared. with it - so until we get those right, this is just one of many more incidents to come.